Drink, Slay, Love in Australia and New Zealand!!! Some cool news... 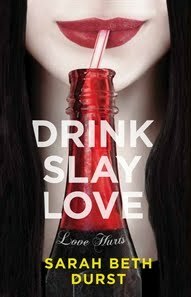 Drink, Slay, Love is now available in Australia and New Zealand!!! The AUS/NZ edition, published by Allen & Unwin, was released just last week! I absolutely love the idea of Pearl (my protagonist) going someplace that I have never been. It feels... magical. One of the things that I always say at school visits and other book events is that being a writer is the closest you can get in this world to being a wizard. I know, I know, that sounds totally cheezy. But I 100% believe it. When you write, you are trying to cast a spell that will take someone out of his/her life and pull him/her into a world that doesn't exist. You're trying to achieve a moment of telepathy, to put a dream from your head into the head of someone you've never met (and may never meet) purely by your choice of words on a page. You're trying to take a stranger on a journey. I love that Pearl has now journeyed to Australia and New Zealand! If you're in Australia or New Zealand, please do keep an eye out for Pearl! I believe you should be able to find her in Angus & Robertson, Dymocks, or whatever your local bookstore is. And if you see her, please say hello for me!